Your guests will love to scoop up these cute and creative baby shower favors! Each set includes 4 heart shaped measuring spoons made of durable stainless steel. Each features a tablespoon, a teaspoon,a half teaspoon and a quarter teaspoon. 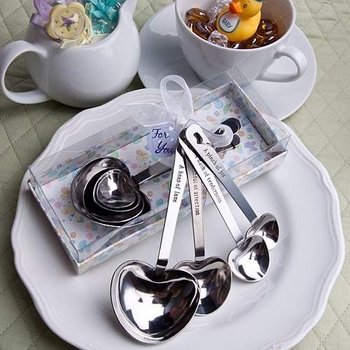 Each spoon is also engraved on its handle with a baby inspired saying of: "A pinch of joy", "A dash of tenderness", "A spoonful of affection" or "A heap of love". Attractively packaged in a clear topped box with a white base and interior with a pastel design. The box is then wrapped and tied with a white ribbon and an attached "For You" tag with matching button themed design. Minimum order is 18 sets of 4 spoons. Please note: The "For You" tag shown in the photo above cannot be customized. Custom Tags or Stickers can be purchased ($.35 each favor) to attach to the gift box for a very unique presentation!